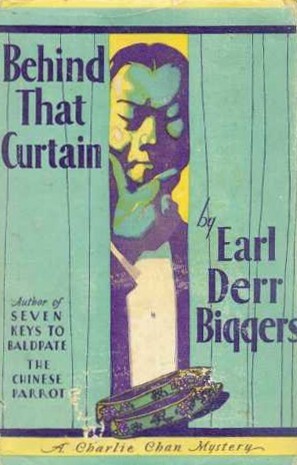 This is the third of the five Charlie Chan novels Biggers wrote, and the third I’ve read, because, you see, I’m reading them in order. After the success of the first two books, House Without A Key and The Chinese Parrot, Chan was a world-wide favorite. The Saturday Evening Post paid Biggers $25,000 to serialize this Chan book, a tidy sum in 1927. Then he was paid by the book publisher, and later he sold the film rights to Fox. Chan is in San Francisco, about to take a ship back to his home in Hawaii. He is invited to a dinner to meet Sir Frederic Bruce, a famous retired Scotland Yard Inspector and also to hear a lecture and see films by famous explorer Colonel John Beetham, recently returned from Tibet. Bruce, in a conversation the previous day, has admitted that though he’s retired, he still has an interest in some cases involving women who disappeared; just walked off into the night and were never heard of again. The most intriguing of these is Eve Durand, who disappeared fifteen years before, in Peshawar, India. He also, it turns out, is trying to discover what became of two other women. Those who just disappear, never to be seen again, hold a fascination for him. This is a typical mystery for it’s time, and a good Chan mystery. There is, this time, a set group of suspects, who were all in an apartment for a dinner and film showing when the murder takes place, the lights turned low, the way to the murder location open to all. So who had the motive, and means? Yes, the characters are a bit cardboard, but does it matter if the pieces are paper or jade if they are moved skillfully on the board? The sense of place is good, the situations only as predictable as expected for this type of mystery, and there’s not the silliness of the films. If you haven’t read a Chan novel, I’d start with The House Without A Key but they are all good reading, and good fun. It’s been quite a few years since I read the Chan books. Such a time as I remember liking them, but not much else. Maybe it’s time to try one again. Now if I could just find the time. I agree with your assessment that BEHIND THAT CURTAIN is Good Fun. I read the Charlie Chan books back in the Seventies and enjoyed them. Like George, I read them back in the 70s. I do remember this one. Jackie’s favorite is the first, THE HOUSE WITHOUT A KEY. She always says she wants to visit the Hawaii of that book, but sadly it is no more. Randy, these were books that I hadn’t gotten to until a few years ago, though I bought this 5 novel omnibus in 1989 and it’s been on the shelf since. I decided to read one over the holidays and enjoyed it. George, in the Seventies I was reading Christie, Chandler and a lot of science fiction, but I didn’t read any of the Chan books until a few years back, with House Without A Key. I read the second one in 2013 and this one at the end of 2014. I’ll probably read the other two this year. Jeff, I like that best of the three so far too, but I have two more to go. Yes, that Hawaii would have been neat to visit. My mother went to Hawaii, on a ship of course, when she graduated from college in the mid 1930s and absolutely loved it, spoke of it the rest of her life. Charles, start with The House Without A Key, first in the series and it introduces the Chan character. I was glad to see this review, because this is the next one I will read in the Charlie Chan series. After reading books 1 and 2, I skipped ahead to #6. I can’t remember why, I usually read in order. This is one of the mystery series my husband and I both like. Very nice review, motivates me to read this one soon. Thank you, Tracy, I hope you enjoy this one. I tried not to give anything away in the review, so I think it will all be there for you to guess.